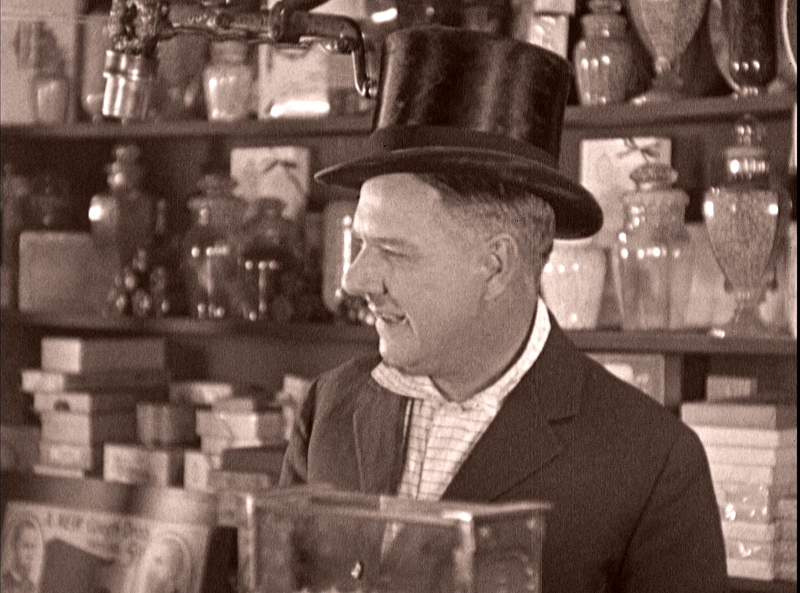 Released by Famous Players-Lasky in May of 1926, It’s the Old Army Game is a comedy about a befuddled, small town druggist, played by W.C. Fields, who gets involved with a real estate scam. 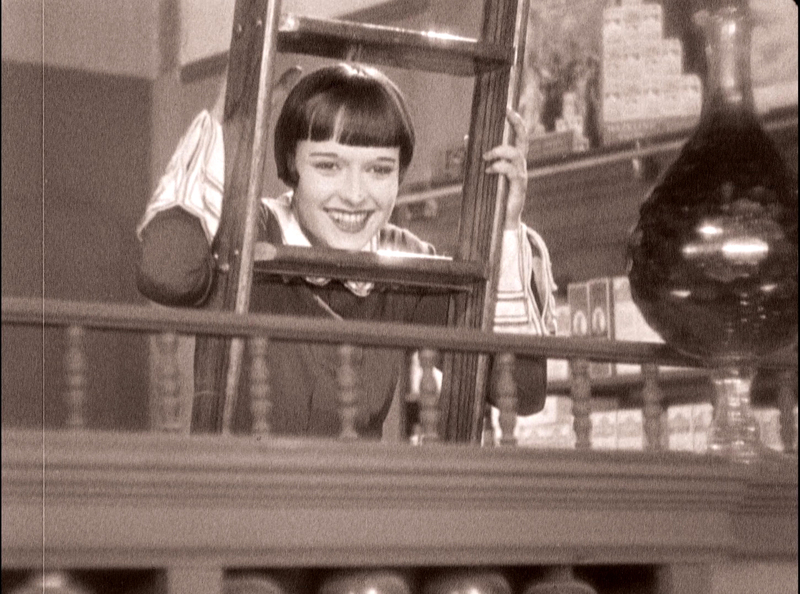 Louise Brooks, on the verge of stardom, plays the druggist’s assistant. Clarence Badger was originally assigned to direct, but the film was soon turned over to Edward Sutherland, a onetime actor and Keystone Cop who began his directing career just a few years before with the help of Charlie Chaplin. The film was announced, at first, as starring Fields and future “It girl” Clara Bow, but as she was needed on the West Coast to shoot Mantrap (1926), the female lead fell to Brooks. 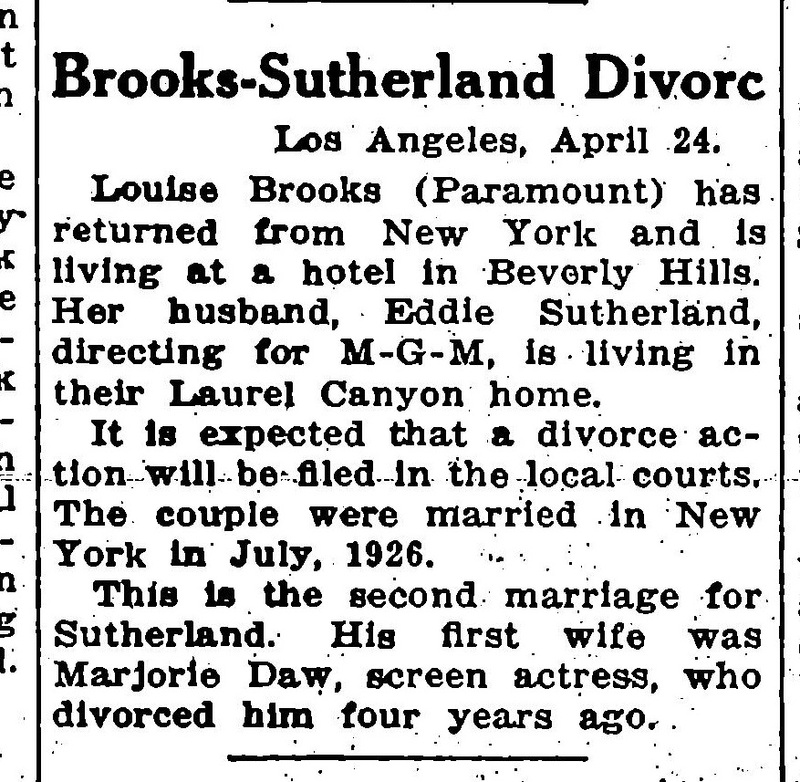 Just nineteen-years old, the film was Brooks’ fourth; it reunited her with the 47 year old Fields, who was starring in his first Paramount film under a new contract. 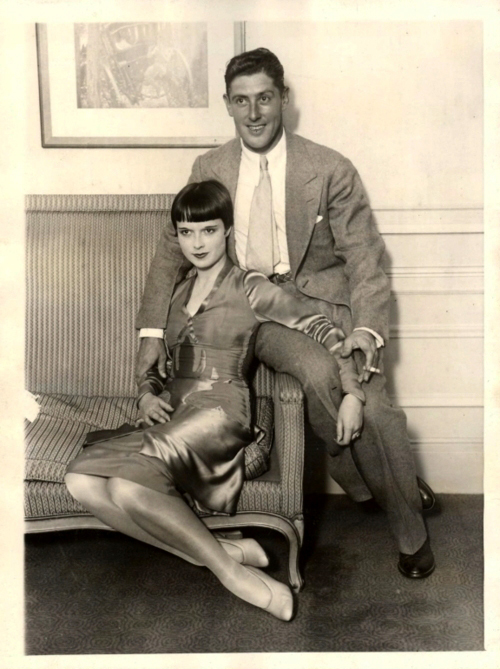 By all accounts, Fields and Brooks were fond of one another, having worked together the year before in the Ziegfeld Follies. In Lulu in Hollywood, Brooks mentions that the two would sometimes hang out together in Fields’ dressing room, and sometimes shared a drink. It’s the Old Army Game was in production in February and March of 1926. Aside from interiors shot at Paramount’s Astoria Studios on Long Island and a few scenes at the end of the film shot in Manhattan, a fair amount of It’s the Old Army Game was shot in and around Ocala and Palm Beach, Florida. 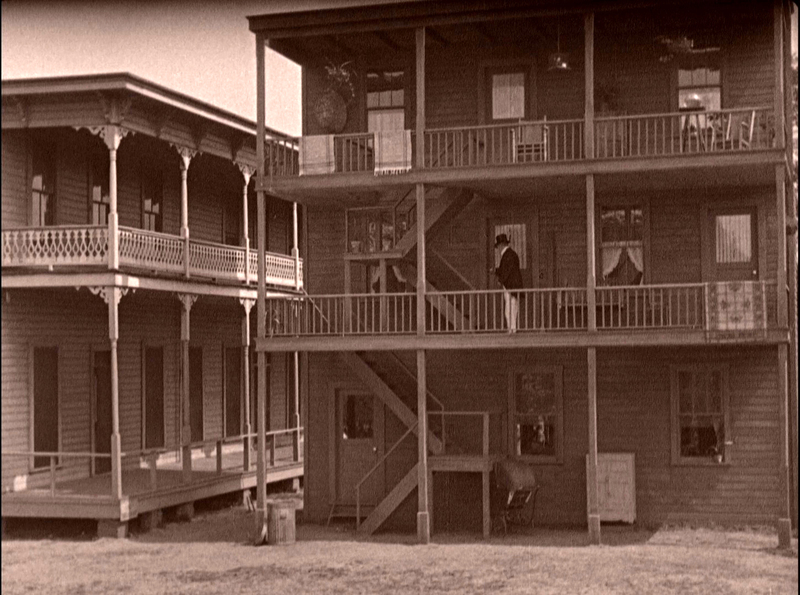 Though Paramount had made other movies in Ocala – including scenes for the earlier Brooks’ film, The American Venus – the small Florida town was more than just an amenable southern location. It fact, it was pivotal to the story told in It’s the Old Army Game. 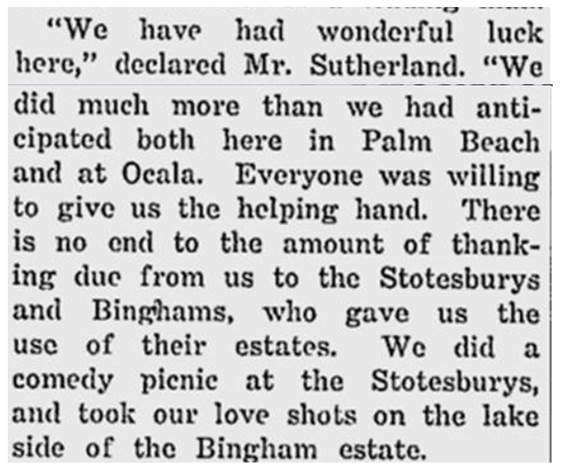 At the time, there was a Florida real estate boom, and many a northerner was duped into buying Florida lots. It’s the Old Army Game reverses the scam, and has gullible Floridians duped into buying New York lots. 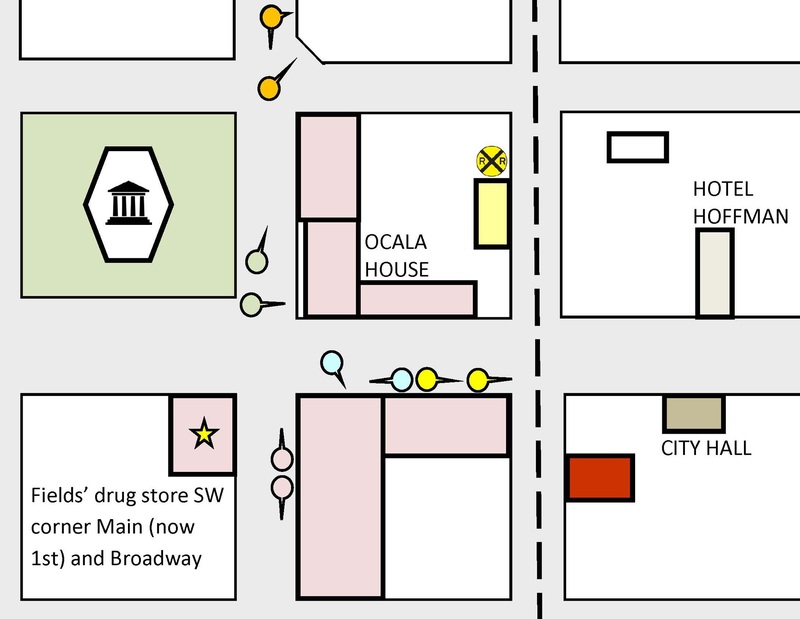 Ocala Florida, looking north, with Fields’ drug store (star) still standing at the SW corner of Main (now 1st) and Broadway. The point of view (POV) directional arrows match the many shooting angles, color highlights below. 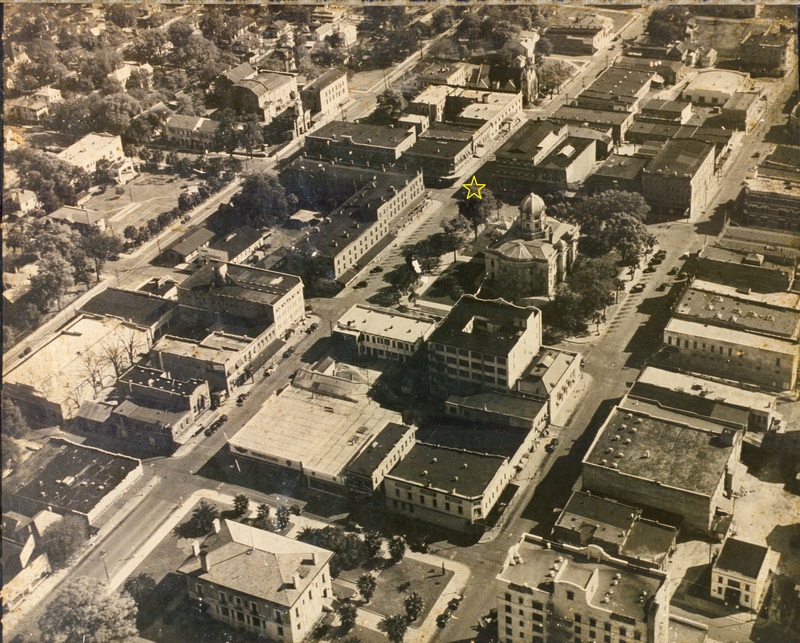 The scenes where Louise and William Gaxton follow each other include the former train station, library, fire station, and city hall, filmed east-west along Broadway and north-south along Main (now 1st). 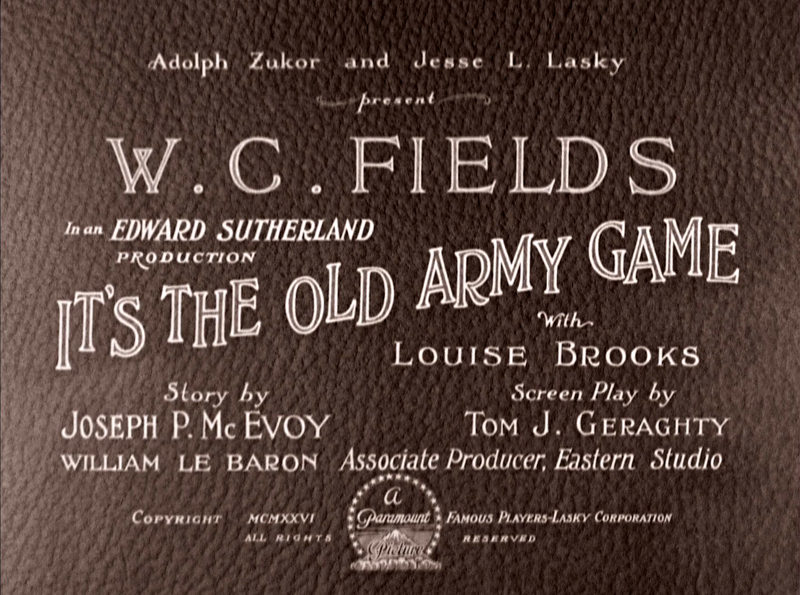 Though not especially well known today, It’s the Old Army Game is a pivotal film in career of W.C. Fields. It was the first in which he enjoyed top billing, and the first in which he had substantial input. Based on a story by J. P. McEvoy and scripted by Thomas J. Geraghty and J. Clarkson Miller, the film incorporated material from Fields’ 1924 stage show, The Comic Supplement, as well as portions of Fields’ act from the Ziegfeld Follies of 1925. Fields’ silent films, which include So’s Your Old Man (1926), Two Flaming Youths (1927), and the recent Kino Lorber release Running Wild (1927), can be seen as a kind of warm-up for Fields’ iconic body of work from the 1930s. Notably, material from the Follies as well as It’s the Old Army Game were reworked in what is widely considered Fields’ best sound feature, It’s a Gift (1934). (Louise travels east along Broadway, a confused Gaxton seeks out her trail.) William Gaxton plays William Parker, Brooks’ love interest and the President of the High-and-Dry Realty Company. Born in San Francisco as Arturo Antonio Gaxiola, Gaxton worked mostly on stage, finding his greatest success in George Gershwin’s Of Thee I Sing (1933) and other Broadway musicals during the 1930s and 1940s. (Louis pauses by a magazine stand on Main south of Broadway, that appears later when Fields believes he’s being chased by a mob. Notice the matching “EAT” sign behind Louise and above Fields’ hat in the shots looking south. The numerous vintage magazines are identified in this prior post. Paramount was taking a bit of a chance on Fields, a Vaudeville actor, who despite his stage renown on the East Coast, was still a little known talent in the movies. After screening the film, one theater manager in Ohio wrote “… the name Fields, so far, means nothing in the small town,” while a Kansas manager stated “Back to the stage for this guy. He is terrible.” One North Carolina manager opined, “I don’t see where Paramount found Fields, or why they continue to boost a star that will absolutely kill an exhibitor’s business.” Advertisements for the film tried to explain its unusual title (“meaning never give a sucker an even break”) and to suggest Fields and this film were a “new kind” of comedy. 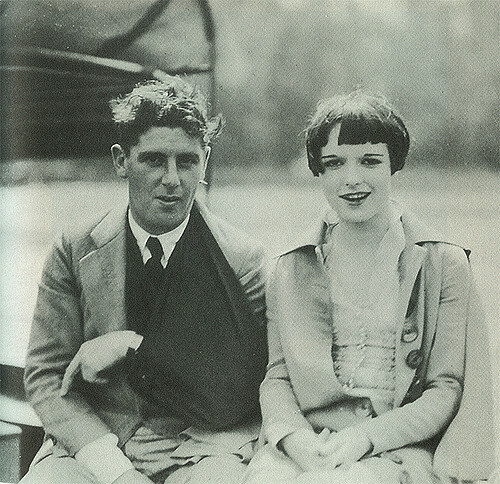 Lisa Bradberry further reports that beginning February 28, 1926, Brooks and Gaxton spent the first of three days filming at the Silver Springs resort nearby. Hundreds of people gathered to watch them film scenes featuring a glass bottom boat ride and later feeding a deer. Director Eddie Sutherland was injured in a boating mishap, spraining his arm. (Note: these Silver Springs scenes are either missing or cut from the final print). Since W. C. Fields was not required for any of the scenes at Silver Springs, and construction on the back porch set had yet to be completed, he took the opportunity to drive through Marion County, spending some time in the country. On March 3 Fields would begin the first of several days filming scenes on the newly constructed back porch set. 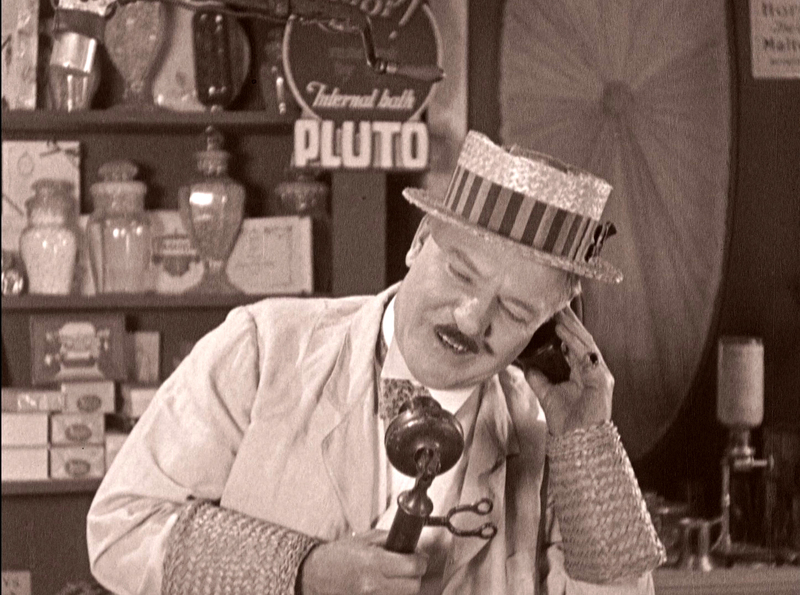 Check out Lisa’s two articles from 2005 about the filming W. C. Fields filming in Florida – 2005 articles by Lisa Bradberry. Thomas Gladysz is the author of the forthcoming Louise Brooks, the Persistent Star, as well as three earlier books on Brooks’ films. 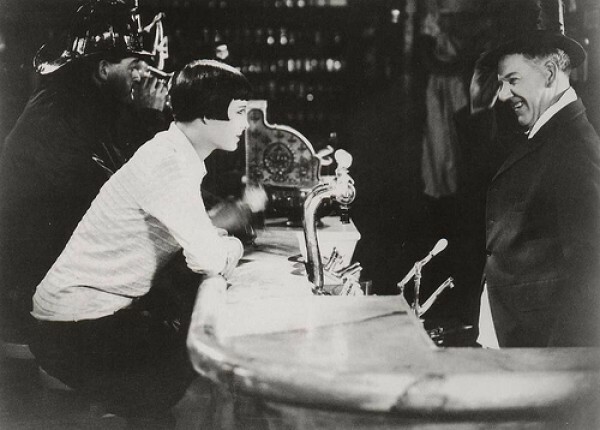 He is currently at work on The Films of Louise Brooks, a comprehensive study of the actress’ movie career. Here is a link to the Louise Brooks Society webpage on It’s the Old Army Game. Also a shout-out to Ben Model for performing the musical score – Ben’s Undercrank Productions has released numerous rare silent film titles on DVD, and to author James L. Neibaur for the audio commentary. Photo sources: The State Library and Archives of Florida, Marion County Historical Photographs. Looking north at the corner where Louise turns up the street. 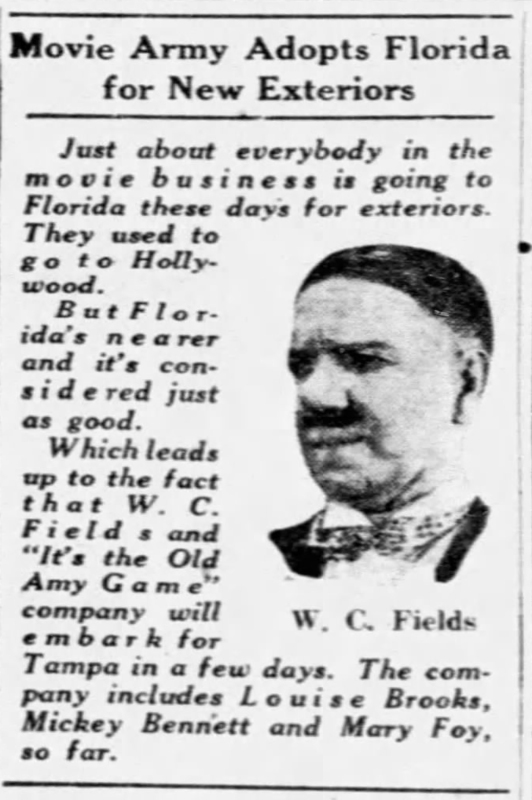 This entry was posted in It's The Old Army Game, Louise Brooks, Ocala Florida, W.C. Fields and tagged Florida silent movies, It's The Old Army Game, Louise Brooks, Ocala Florida, Silent Movie Locations, then and now, W.C. Fields. Bookmark the permalink.